This series is getting long, but there is one more avenue to explore before it can be finished. We left off with the kissing conundrum that was not completely resolved. That’s ok. We may not resolve this problem either. The kissing problem is that up and down looking Modtran intensity/blackbody values for CO2 spectra always kiss, even below the 1 km altitude where CO2 spectra are indistinguishable from blackbody in Modtran. What we must explore to finish this series is what changes take place at a kilometer altitude to allow CO2 to begin radiating? To be clear, CO2 must radiate below a kilometer altitude to some extent, but it is absorbed so quickly that the Fourier Transform spectrometers used to gather the data for Modtran see the atmosphere below one kilometer as a brick. A brick where individual molecular spectra are not apparent. A brick that radiates very close to the blackbody curve. Above you can see the first hints of deviation from the blackbody spectrum looking down at one kilometer in the red curve, and the very strong deviation in the blue curve looking up. This can be contrasted with the 100 meter or 1000 MB level where no deviation from the blackbody is seen in the CO2 bands looking down. This is what has changed. A new source of energy from the release of enthalpy of vaporization becomes available at the condensation level at about 1 kilometer altitude. This is the typical altitude of the bottom of the cloud deck. 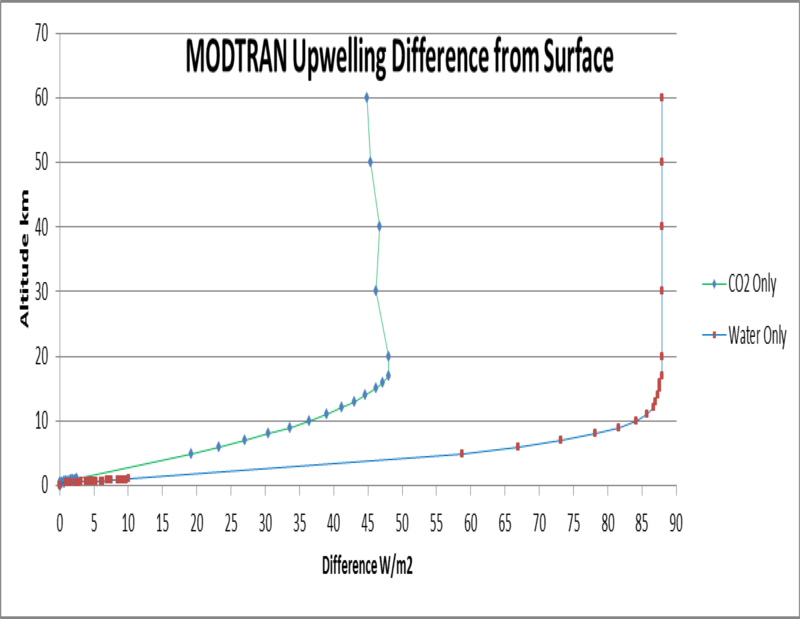 We can summarize this entire Modtran up and down exercise with the following image. The background image credit to the Cloud Appreciation Society. The principal greenhouse gasses do not absorb or radiate separately from the mass of the atmosphere below one kilometer. This is partly a pressure effect. All outgoing IR radiation is completely thermalized below this level and energy transport takes place by conduction and convection. 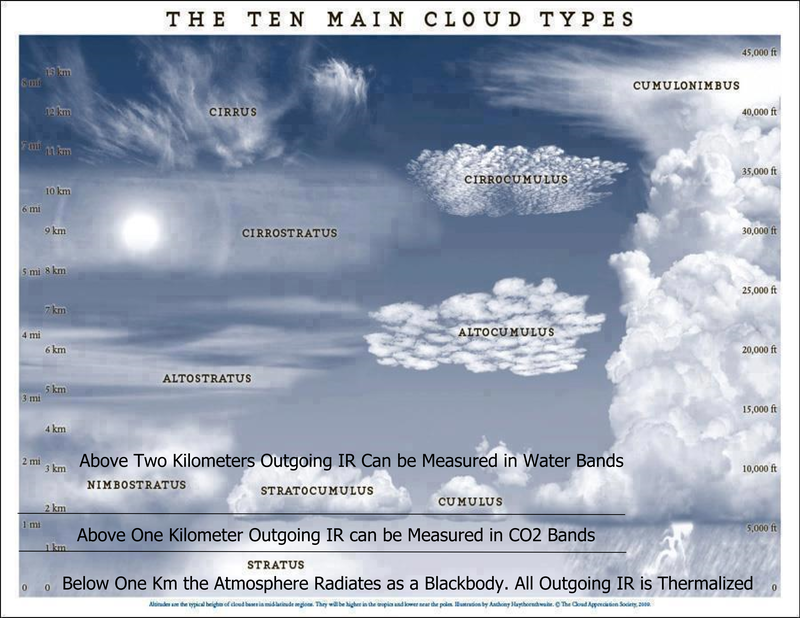 Above one kilometer we begin to see distinct outgoing radiation in the CO2 bands. Above two kilometers we begin to see distinct outgoing radiation in the water bands. Outgoing radiation in CO2 bands increases continuously from one kilometer until it reaches a maximum about 17 kilometers. Outgoing radiation in water bands increases steadily from two kilometers and also reaches a maximum about 17 kilometers. That they both should reach maxima at the same altitude is very interesting. Who knows? We may have do do another post in this series some day.